The AOC 27V2Q is a 27-inch ultra-slim monitor that combines an incredibly thin display with very narrow bezels to make for a stylish addition to any desk. An IPS panel and 1080p resolution ensure decent overall image quality and you’ve a 75Hz maximum refresh rate and Freesync as well. All for well under £200. But first to that styling and AOC really has done an amazing job in creating such a thin display. It’s just 7.9mm thick at the top and rises to only 18mm at the bottom. The bezels are also amazingly slim and low profile too, so the display’s surface runs right to the edge of the panel. The addition of a very simple slender stand and use of a plain black colour scheme completes the look. However, while first impressions are good, peer a little closer and you can see just how AOC has kept the price of this display so low. Nearly all the exterior surfaces are plastic and round the front the base and bottom bezel have a glossy finish too. This means they’ll show scratches, fingerprints and dust far more readily than a matte finish. The large expanses of flat plastic also show up any slight wobble in their surface, again making it clear this isn’t a truly designer display. But still, for the price, it’s fine. Onto more practical considerations and one of the main failings of this display is that its stand is very basic with only tilt adjustment incorporated into it. It also can’t be removed in order for you to use an alternative one. There is a good reason for this, though, which is that in order to make the display so thin, AOC has had to put the connectivity in the stand. You get a headphone jack, DisplayPort and HDMI port and then a barrel connection for the power. A small power brick does the power conversion from the mains. On the underside of the display there’s the power button and four further buttons for controlling the on screen display. The way these and the OSD work isn’t the most intuitive but it’s not too bad. There are ample options for adjusting the image quality, including brightness, contrast and gamma controls in the luminance menu and several colour temperature options and a user adjustable color mode in the color menu. For gaming, you can’t adjust the maximum refresh rate of the display – you just set that in Windows – but you can tweak the overdrive setting to help sharpen up the image a bit. I’d recommend opting for the Medium setting as this sharpens the image as much as possible without introducing the really obvious inverse ghosting of the Strong setting. As to the display itself, its use of an IPS LCD panel ensures viewing angles are good, with colours varying very little as you move around, though the image does darken a little as you move off axis. Overall colour fidelity, contrast and gamma are all good too. Colour balance isn’t perfect right out of the box but it’s good enough to get by and the balance can easily be tweaked via the display’s OSD. Just switch to the user colour profile and drop the blue channel a little. When it comes to the finest differences in colour this display can’t compete with more expensive IPS displays as its panel only uses 6-bit colour processing, but it’s fine for non-professional use and again it’s to be expected for the price. However, there are a few things here that may put some users off. The first is the amount of IPS glow and backlight bleed. With a pure black screen, there’s an obvious light area in the bottom left corner, which doesn’t really go away, no matter what angle you view the screen from. Meanwhile, if you move to the side the whole screen can take on a slightly greyer tone. Nearly all IPS LCD displays have similar issues and generally I consider it not a major problem, as most of the time when you’re using a monitor you’re not viewing a totally black screen. Here, though, it was noticeable even when viewing lighter and more colourful images. It’s by no means awful but if you’re particularly distracted by such things, this may not be the display for you. There’s also the relatively low resolution to consider. Generally, I find 1080p on a 27-inch screen to be too low. It just looks too blocky for my liking. But if you like to have your monitor set further away or you just prefer a larger image then then this does the job. Finally there’s the fact that the maximum brightness is quite low, at just 230nits. This should be ample for most uses but if your office happens to be in a bright sunny room it may prove a little low. 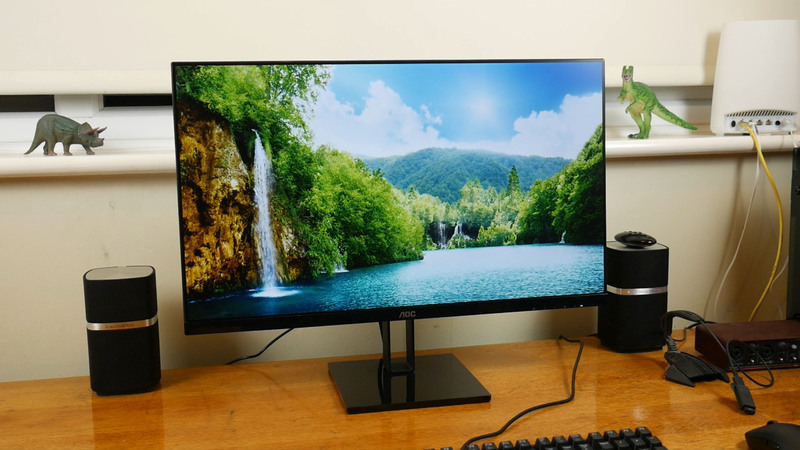 As for gaming, the 75Hz refresh rate is a noticeable improvement over 60Hz screens. By all means, for serious gaming you’ll still want a 144Hz screen but those extra 15 frames a second do help to smooth motion out just a little and make for a more responsive gaming experience. It’s even nice just to have on the desktop, smoothing out cursor movements and the like. So overall, this is a nice monitor. It offers a good combination of features, reasonable overall image quality and a stylish design. It’s not perfect but for its price, it’s a decent buy.